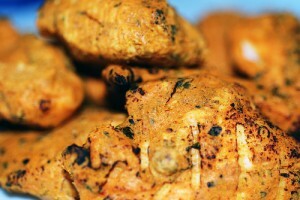 Easy Diet Chicken Tikka recipe by lifelongpk at DesiRecipes.com. Wash the chicken portions properly. Paste them with red chilli powder, turmeric , salt and girger garlic paste. Put them in a pot and add the vinegar on top. Leave it on a very low flame for 15-20 minutes. You can also bake them in oven for 20 minutes. Delicious diet Chicken tikkas are ready. NO EXTRA OIL ADDED!!! !